When the world calendars turned over to the year 1800, most of Earth’s goods were taken to market by beasts of burden and the ocean’s shipping lines. In just a few decades, steam-powered trains crisscrossed the world with their metal rails. Until well after World War II, steam trains moved goods over land. Steel tracks ridden by trains with steel wheels take a tremendous amount of force to move. The weight of the trains also takes their toll on the tracks and the wheels of the train. This requires an incredible amount of money to initially install the tracks, and in turn even more for their maintenance. Today the fastest trains hover above ground using the power of magnets. Before magnets, engineers figured they could do away with railway tracks entirely if they developed trains that utilized hovercraft technology. Instead of magnets making the trains float just off the ground, scientists figured they would be able to do the same on a cushion of air. All that would be required would be a track that was nothing more than a concrete slab; way cheaper than railway tracks. In the 1960s and ’70s, America’s Urban Mass Transportation Administration (now the Federal Transit Administration) sponsored two designs: the Grumman Tracked Levitation Research Vehicle (TLRV) and the Rohr Aerotrain. The TLRV designers hoped to reach speeds of up to 300 mph, while the Rohr Aerotrain, which was to carry 60 passengers, hoped to reach 150 mph. Test tracks were created in Pueblo, Colorado. Even though the track’s length limited how fast they could run, both prototypes worked. The TLRV reached speeds of 90 mph and the Rohr Aerotrain reached 145 mph. The track was limited to 1.5 miles, and designers knew they could go faster if they had longer test tracks. Sadly, before the trains could be developed, funding was cut and the prototypes left to rot. Now the remaining hover trains are in the process of being moved to the Pueblo Railway Museum. One of the first monorails was built as a novelty ride at the 1876 Centennial Expo in Philadelphia. Just 10 years later, Josiah V. Meigs built a demonstration track and train in East Cambridge, Massachusetts. He patented the technology and then spent the next few years operating the functioning train in hopes of expanding around the world. At the time, elevated trains, using conventional rail technology, were being rolled out in major cities but residents complained that the huge structures made the streets underneath the tracks too dark. Meigs hoped his monorail idea would solve this problem with its one skinny rail. According to a 1992 Boston Globe article the train was scrapped due to suspected arson and vandalism, possibly from other train competitors. More train development has always been hampered by the need to first build the railway tracks. In addition to the materials to build the tracks, you first have to purchase the land where it will travel. This can be incredibly expensive, especially when the railway enters more urban areas. The Bennie Railplane hoped to solve this with an overhead rail system using plane technology. A prototype was launched in Scotland in July 1930. The Bennie Railplane people movers were powered by propellers that would “fly” over existing train lines. While the concept received interest from around the world no one would invest and the overhead flying Bennie Railplane was scrapped in 1956. Dr. Axel Lennart Wenner-Gren dreamed of fast trains, and in the early 1950s started the Alweg transportation company. He hoped to develop high-speed trains that would transport passengers from city to city. His prototypes did prove his trains could handle highly banked curves, of great importance when dealing with difficult terrain. Alweg didn’t receive any more investments but a scaled down version, the Monorail System of Disneyland, opened in 1959, and another small line was opened in Seattle for the city’s 1962 Expo. Besides these two, the Alweg system failed to catch on until it was bought by Japan’s Hitachi Monorail company, who have used the tech to build a number of the scaled down public transit lines in Asia. Not that some Houstonians didn’t try. With increasing traffic problems, in 1956 Monorail Inc built a test track at the city’s Arrowhead Park. 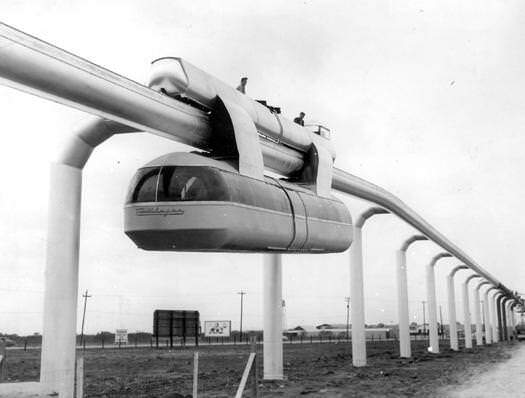 The futuristic cars traveled on a sleek monorail carrying 55-passengers at around 10 mph. While the train got a lot of attention, the city instead turned to buses and expanding its freeway system to handle more private vehicles. After a few months, the Houston monorail was dismantled and shipped to be exhibited in Dallas. In 1879, inventor Louis Brennan successfully launched the “world’s first practical guided missile.” The British War Office officials were so happy at the demonstration missile they bought the patent for £110,000 (£9.5 million in 2018). Brennan worked a number of years for the UK government before turning to his true love: trains. Buying land for the railway tracks is expensive, but so too are the actual rails. Brennan had a novel plan for this issue: reduce the two tracks trains used to one. To accomplish this he built an incredible balancing train called the gyroscopic monorail that balanced on a single rail using the powers of gyroscopes, or spinning wheels, that use physics to balance. In 1910 the train passed all tests, functioning perfectly even with a full load of passengers leaning to one side. The only problem was without the operating gyroscope the train would fall over. When he couldn’t guarantee a gyroscope that wouldn’t break down, investors panicked and withdrew their money. The final nail in the coffin was World War I, when project funding was funneled into helping the war effort. Around the same time the elevated Railplane Train was being proposed in Scotland, the Germans were developing their own prop-driven train. Instead of flying overhead existing train lines, it would use conventional ground-based railways. And instead of steam engines, it would be powered by airplane propellers. The Germans called this streamlined propeller-powered aluminum train the Schienenzeppelin after their huge Zeppelin airships. Built by the German rail company Deutsche Reichsbahn in pre-Nazi Germany the train performed beautifully and in 1931 reached speeds of 140 mph. One of the fastest trains of its time it never made it into production due to concerns about passenger head decapitation if people accidentally got too close to the rear of the train (er… yeah, that seems like a good reason for concern). When Hitler came to power the historic train was melted down to feed the Nazi War Machine. Since the days of steam, the method of rail propulsion has changed little. Mechanical power is transferred to the engine, which drives the wheels and powers the train forward. The mechanical power can be steam, gas, diesel or electricity but the principle is basically the same. In 1966, the New York Central Railroad corporation tried to change this by strapping two jet engines, taken off an American intercontinental bomber, to a streamlined train engine. The result was the M-497 Black Beetle a train which, on test tracks, reached speeds of 183.68 mph, an American rail speed record that remains unbeaten to this day. When New York Central Railroad corporation merged with its rival Pennsylvania Railroad, the project was abandoned. In the Soviet Union, a similar concept, the SVL Turbojet Train, was developed and also abandoned. Using cameras, sensors, and radar, Tesla, Uber, and even Google are all pouring billions into testing in hopes of mastering driverless cars. China is taking these concepts and applying it to their trains. In the summer of 2017, the CRRC Zhuzhou Institute Co Ltd unveiled a concept train, Autonomous Rail Rapid Transit (ART), in the city of Zhuzhou. This train follows a marked path made only from painted “tracks.” No railway tracks drastically increase the flexibility of the light rail passenger service. If there is heavy traffic or an accident, the train can detour around the disruption. No actual rails mean less money spent on track maintenance and initial railway installation. When the prototype goes live it will have drivers but will soon after be automated into a Driverless light rail train. As early as 2010, a Chinese company proposed a giant vehicle, the TEB, that would drive on stilts over and through congested traffic. In May 2016, the company released a slick video and scale model showing the concept. Observers were quick to point out how impractical this would be. Tall trucks or vehicles with towering cargo would be struck by the TEB as it passed overhead. Drivers might panic when the TEB passed, potentially swerving into the TEB’s driving stilts much like the famous Christmas Vacation scene when the family station wagon gets caught under a logging truck. Other concerns included: how would such a long vehicle turn corners? What would it do when it encountered bridges or footpaths? Yet, to everyone’s surprise, a full-scale prototype was built and unveiled in the summer of 2016 in China’s Qinhuangdao city. TEB, or Transit Elevated Bus, actually ran on special tracks and could not swerve. Since it is limited to straight railway tracks it should really be TET or Transit Elevated Train. Its makers claimed the prototype, dubbed Batie, could carry the equivalent of 40 conventional buses worth of passengers. Its belly towering over the road at 2 meters high, traffic, in theory, could pass under — but only small vehicles, not trucks. As the world expressed its wonder at the audacity of the plan, the Chinese government began to investigate. More alarm bells went off when it was revealed the company touting the TET was Huaying Kailai, a blacklisted Chinese corporation known for its shady investment schemes. Just a few weeks later, Chinese officials shut the project down. Later, it was revealed that over 30 people were arrested, including the head of the group, Bai Zhiming. In the summer of 2017 Batie lay abandoned and rusting in a parking lot filled with overgrown vegetation. The New York Central M-497 was converted from a Budd RDC Car. It was designed to test the dynamics of high speed travel on steel rail. As crazy as it looks the jet engines were able to propel it to speeds that existing conventional propulsion systems, diesel, electric, gas turbine, could not at the time.